← For the Love of Christmas Pixies! Have a Very Disney Christmas with Mickey, Goofy, Tron, and V.I.N.C.E.N.T. As evidenced by the other articles you’re seeing pop up this month on The Collector Gene, we’re a family that’s very, very, VERY much into the holiday season. My parents have been very, very lucky to amass such a nice collection of antique Christmas ornaments and old German decorations, and my sister seems to be cornering the market on vintage knee-hugger elves (even going so far as to create her own interpretation this year). But how am I able to collect Christmas memorabilia that reflects what I collect? Well, what I collect involves a lot of characters from the 1980s and 1990s, and to cash in on the holiday spirit, many of these characters appeared in various Christmas specials or comics or whatever. From He-Man to the Teenage Mutant Ninja Turtles, there were a fair number of idols from my childhood who donned their gay Christmas apparel for the sake of my amusement. It wasn’t until a few years ago when I rented my first house that I had enough space to really go crazy with my own Christmas decorations. A wreath and two three-foot-tall Christmas trees filled with ornaments just weren’t going to cut it though. I needed something BIG, a standout piece that said it was time to celebrate the holidays while also celebrating my everyday nostalgic existence. I made that find at a flea market that fall for a whopping $10. 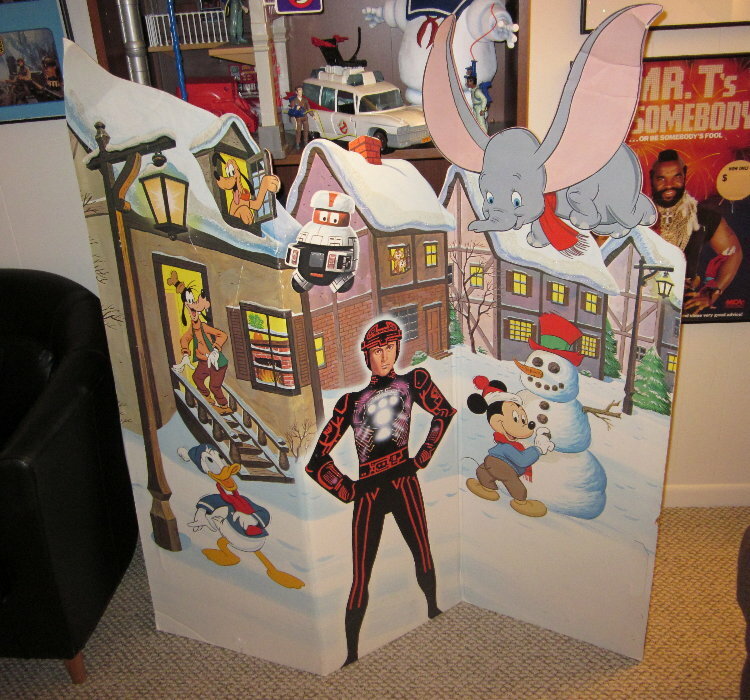 This large cardboard display stands about four feet tall and a little over feet wide if it’s folded out flat. It’s a winter wonderland populated with some of Disney’s classic characters, from Mickey and Goofy and Chip and Dale to Tron and V.I.N.C.E.N.T. from Black Hole. Wait…what? These days, Disney is laying claim to all sorts of hot properties, including the entire Star Wars and Marvel universes. Back in the early 1980s, though, the Mouse House only dipped its toes into nerdy properties after the blockbuster success of Star Wars. Tron was only a moderate success, while The Black Hole barely turned a profit on its $20 million budget, the most expensive movie made by Disney at that point in time. These two properties weren’t profitable or popular enough to continue pursuing, but they had enough of a cult following to be remembered fondly. The back of this display says Walt Disney Home Video, so my guess is that this is one part of a massive store display to promote Disney home videos in the early 1980s. Tron was first released on home video in 1983, so I think this is from around that time. If Tron and V.I.N.C.E.N.T. were not on display, I don’t think I could date it that specifically, although the other Disney characters are very reminiscent of how they looked in the 1980s. Obviously, my main reason for buying the display was those two center characters. I usually place this in my living room around the holidays, and for some of my friends, it’s the first decoration they see in my house. Since then, I’ve added many more items to my “pop culture Christmas” collection, but this was always the starting point, and I am thrilled that what was once a disposable store display has become a holiday tradition for me. This entry was posted in 1980's, Advertising, Ben, Disney. Bookmark the permalink.